Our goal is to help Hiscox continually grow their share of the home insurance market while continually lowering CPA. Having already created highly responsive direct acquisition campaigns, we were now challenged to beat our control packs and emails. Our audience is high net worth families and individuals. These people accumulate many valuable possessions – typically jewellery, watches, art collections, technology and, indeed, second properties. This makes them highly likely to find themselves underinsured if they choose a typical, price-focused home insurer that offers far more limited cover than Hiscox. According to our research, as many as 75% of High Net Worth households are underinsured (against a national average of 20%). This problem is compounded by the fact that purchasing home insurance as a low interest task, where customers don’t take the time to look closely at what cover they’re getting. We therefore need to demonstrate to our audience that when it comes to home insurance, the devil really is in the detail. Our approach was to build on the successful attributes of our previous campaign, where we first introduced the thought that ‘there’s nothing more expensive than cheap home insurance’. Building on aspects of this campaign that clearly were working well, like comparison tables to show how much more cover Hiscox offers, we then developed work that stressed the importance for HNW households to look closer at their policy, for their own sake. The Devil in the Detail campaign is a smart way to deliver our key message. We created a visually striking DM (and email animation) to capture the attention of our audience and make them look closer at the communication so they could see where the devil lay. It’s an intelligent idea that shows a respect for, and understanding of, our audience. It also allows us to highlight the worry of devilish small print threatening their financial wellbeing. 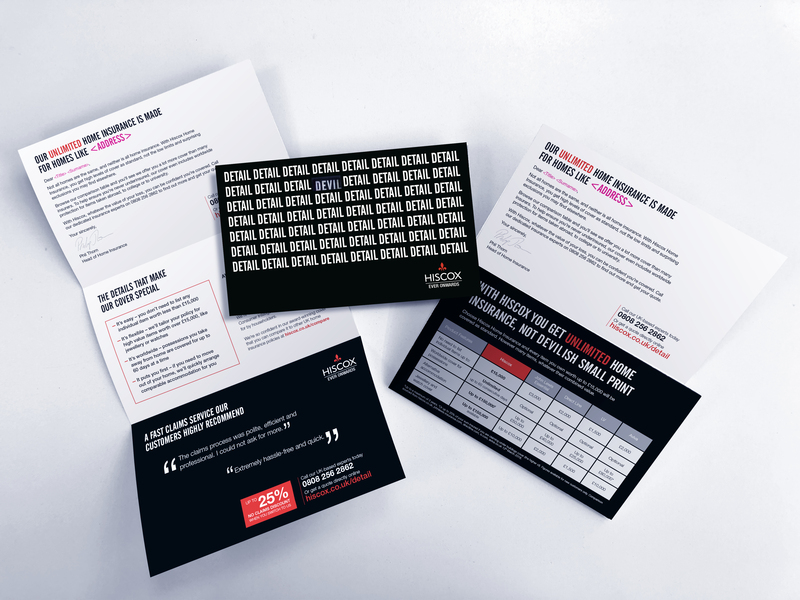 By using clear and engaging messaging to explain the danger of being underinsured, and the very high amount of cover you get as standard with Hiscox, we showed why they are the go-to brand for affluent people. Aligned with Hiscox’s proprietary targeting methodology, the campaign targets high value prospect segments with an increased likelihood to be in the market for Home insurance in the month they receive our comms. This audience includes some of the most affluent individuals in the UK who are cautious about what they spend money on, but are willing to spend more to ensure they get the service that meets their needs. This campaign went live in May and we are looking forward to getting initial results later this month.